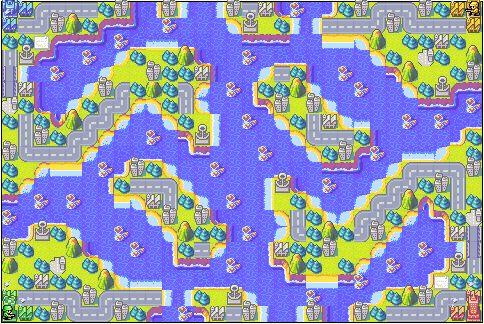 Now, before we get too much into why maps like this don't work well, I want to briefly discuss some principles behind how Advance Wars works. For simplicity, I'll focus on a conventional 2-player match between closely matched players, but the same principles apply to multiplayer. As we all know, the goal is to attack your enemy and eliminate the opposing player's units or capture their HQ. As you attack, you not only deal damage, but also gain ground and access to cities and key properties, such as towers, which help build your momentum. At each stage, players need to secure their position so that ground and momentum are not lost; there can be a good amount of give and take in the battle as the advantage swings back and forth between players. Eventually one of them will deal a decisive, game-determining blow or more gradually gain a long-term advantage that essentially makes them unstoppable. Dealing Damage- This is straightforward. You attack your enemy with the goal of causing greater losses (financially or tactically) than you receive in return. Gaining Ground- This is also a straightforward concept. If you don't advance toward your opponent's base and HQ, you will not be able to gain victory through either capture or rout. Securing Position- Like gaining momentum, this is a bit more complicated and ties in tightly with some of the other concepts. Simply put, in order to continue gaining ground or prevent loss of ground, your position at any point must be secure enough to withstand potential attack and counterattack. There are a few factors that impact your ability to secure position: First, the number and type of units you have compared to your opponent with impact how secure your position is. Second, the formation of these units is critical, with techniques such as meatshielding being a basic example. Third, terrain can be used to protect and channel enemy forces or provide defensive bonuses to your defending units. Lastly is reinforceability. Essentially, how quickly can you respond to a threat in that area if an enemy attacks; I tend to include healing bonuses from friendly cities in this category as well. Alright, now that I've bored you with how the game normally works, let's talk about island warfare. The capture phase within your own island(s) is pretty normal in the broad strokes until you start hitting contested properties. This is where the problems start- it basically becomes a rush to the central islands, if they exist, and whoever lands first gains a significant advantage. Why? Well, by landing first, they either capture first or gain first strike against the enemy landing party (or both). As a result, they likely end up capturing the island, especially if it has a production facility. This is FTA at it's finest. Now, let's pretend the neutral/central islands were divided evenly and everyone has captured the ones that belong to them. We've enter the midgame, and the real battle starts to evolve. What targets do you have? Well, the enemy has islands to attack and presumably a navy and/or airforce defending the surrounding area so those represent your short term objective(s) and your obstacle. You naturally take your own navy and airforce and prepare for attack, but here's where there's a catch: Naval and air units do not function well independent of a significant land front. Imagine you try to push the enemy forces back to reach the nearest island. Once you've attacked, how do you protect yourself against counterattack? There's limited terrain in the open water, either to direct enemy forces or to provide defensive bonuses. You also don't have nearby cities to heal your units and you're getting further from your own production facilities and closer to your enemy's, which is particularly impactful in naval/air battles where resupplying is more critical compared to land units. You can build a defensive formation, but without terrain to help you, you'd need to rely heavily on meatshields... except that you don't have any good ones because they're so expensive. I'll go a bit deeper into the economics and unit functions at the end, but for now, suffice it to say that it's much harder to build an effective formation than it is in land battles. Without the ability to defend effectively against counterattack, it's difficult to consistently press forward. So let's imagine that you've overcome this stage and made enough progress that you have a chance to take the nearest enemy island. By this point, they will surely have lined the perimeter with very cheap infantry to block the landing sites and have other units to attack any landing force, which will be vulnerable for a whole turn prior to being useful. There are already logistical issues with getting the land units there to begin with, so having limited or vulnerable landing areas and/or small combat zones make landing an attack party impractical. The only real option is to bombard from a distance until the enemy units are decimated, but this can be a long, grueling, and often unsuccessful task. Once you successfully take the enemy island, you'll gain the resources there, but while they may help, they frequently do little to make taking the next island easier than the last, and the enemy has even shorter supply lines than before, potentially giving them the edge they need to reverse your advantage. If you do manage to make it to their last island (or one with a base), you now have to contend with direct land unit reinforcement, which can be extremely resistant to landing parties. It’s worth mentioning, though, that clever HQ placement can at least help to remedy this last issue, by circumventing the need to land on such a well defended island. Island warfare maps are particularly prone to FTA and gameplay will suffer without a significant land front. With only naval and air units, you can most likely deal damage during your turn, but you'll frequently take about as much in return, resulting in no net gain. This is because, while you may gain ground in your attack, you frequently have difficulty securing your position due to lack of terrain and economical meatshields and you can't build momentum without capturing cities, etc. along the way. On the contrary, the defender builds momentum as logistics shift in their favor the closer you get to their production facilities and, meanwhile, on their islands, they've been able to secure their position and have the advantage of dealing damage to any landing party before it can serve its intended purpose. As a result, you end up sacrificing interesting tactics and maneuvers in exchange for brute force hammering and standoffs. 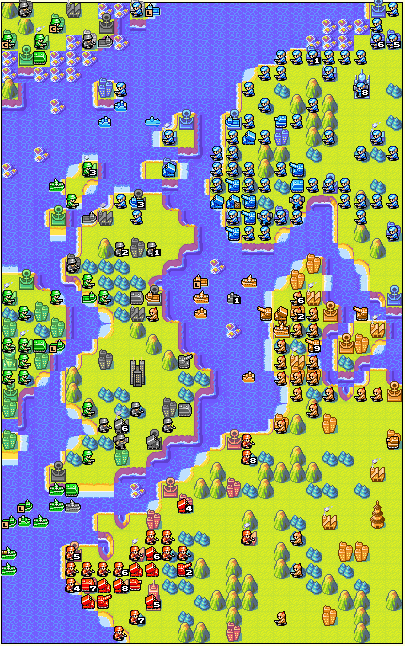 This is why island warfare without a significant land front does not work well in Advance Wars, and especially on AWBW. Okay, if you're still hanging around and you're interested about the economics and relative cohesiveness of unit functionalities of land/air vs naval/air battles, you must be a glutton for punishment, but who am I to deny you? Let's get into it! Now, as I implied earlier, naval/air units don't meatshield well, but the fact is that they just don't work together as well as land or combination land/air units do. A good example of this is indirect units. Land indirects hit any threat except air units, which are typically a minority on the battlefield, giving you very effective zone coverage. In air/naval battles, you need 2 different indirects for zone coverage, and there are no cheap alternatives equivalent to an artillery. Instead, they're the 2 most expensive units in the game! Similarly, apart from being significantly less expensive overall, land units have a wide range of costs and unit functionalities. Some units are very cheap and versatile, such as infantry, while others are expensive and highly specialized, such as missiles. Tanks are a middle ground for being pretty versatile and reasonably priced, which is why they're your bread-and-butter units. AA are similarly priced, but specialized. You can also tech up from say, artillery to rockets or tanks to md. tanks. Air units fit in well here because, on account of their higher cost, they are used in moderation, and most frequently as copters. B. copters are essentially highly versatile tank counters at a higher cost, but they have a major weakness to AA and other copters, encouraging unit variety and thoughtful tactics, blending generalists with specialists optimally. When you look at air and naval units in combination, you don't see this same dynamic. While air units are cheaper and typically preferable as a result, you'll still get a reasonable mix of the two unit types on island warfare maps with both. Why? The fact is that there isn't a lot of variety in either category and you lack any major tech up options and thus you struggle to form a successful attack force with just one of the two types. You also tend to lack generalists and have a lot of primarily specialized units because there are a lot of restrictions and immunities. Bombers and battleships can't hit air units, fighters and carriers can only hit air units, copters can't hit non-copter air units, subs can hit only naval units, at least one of which is an inadvisable target, and are immune to almost any unit when submerged and stealth are basically the same but with air units (except they can also hit naval units). That pretty much summarizes all combat units except for cruisers, and only two of them, cruisers and stealth, can hit most anything. Another significant factor here is meatshielding, which I mentioned earlier. Really, your meatshield options in this case are t. copters, black boats, landers, and potentially submerged/hidden subs/stealth. Looking at a cost comparison, an infantry is 1/7 the cost of a tank, yet a t. copter is over 1/2 the cost of a b. copter, or 1/4 the cost of a fighter, and a black boat is more than 1/3 the cost of a sub. Yes, the transports also serve another purpose over the standard infantry, but in practice it's not that different. In land battles, you use infantry to capture cities, attack other infantry, and meatshield. In naval/air battles, transports facilitate capturing of cities in addition to their meatshield role because they are required to get the infantry from one island to another. They also don't attack other meatshields, though the black boat can refuel and repair 1HP of a unit per turn (at standard cost). The point of all this is to say that yes, they have different abilities, but they don't overall exceed the utility of an infantry meatshield, despite a significantly higher relative cost. This means that, all else being equal, you can't afford the same meatshield-to-military-force ratio. In short, naval and air units are not well suited for use without land units, and are instead designed to be incorporated as support for a land front. Alright, I think that about sums it up. You can go home to your families now. Well, hey, I'm glad for better commentary on what goes wrong with naval warfare. It's definitely better than "omg no land-sea interaction it sux" but what do I expect from....THOSE toxic people who have harassed me and then claimed I had been harassing them. Given the nonsense they have gladly supported....but I'm digressing. Besides, it's as you basically said on Discord: if somebody can provide a pleasant surprise within the understanding of the points made, that would be VERY welcome. That first one I am not sure how that could be fixed. The second one, however, I mentioned about how navy units are supposed to be Stone Walls and air units are meant to be Glass Cannons. Here's what's on my mind: frontal Harbors without too much concern of having too many, and any Airports pushed to the back. I do not think it's really possible to have too many Harbors, because the lowest price tag of a sea unit is 7500 in BW or DS, 6000 in DoR. Compare to the Battleship's 28000 in pre-DoR, 25000 in DoR. Heck, the Submarine costs 20K and 1HKOs those potential spam units. Of course, it wouldn't address everything. Economy is, of course, a problem that naturally speaks for itself as always, even explaining a good chunk of everything else you said. And there's more than that going on to really suffocate the navy, even if we also got past the lack of anti-land and anti-air capabilities of the navy as a whole, the Battleship (anti-land), Cruiser (anti-air), and Aircraft Carrier (anti-air) not withstanding. What makes navy harder to balance is when it is supposed to be a tech option in its mere choice, even without the immense expenses where the freaking Cruiser costs more than an MD Tank. It's something I noticed helping to balance Shattered Throne. That's not the only concern coming up from doing that either. There is a RPS triangle among others I have come up, more or less, where Cover beats Focus, Focus beats Flanking, Flanking beats Cover. If a primary defense that relies on the land force, then the navy units are going to be *BAD* with the Cover angle. Navy units have to handle the Flanking point well or they are going to have a miserable time in justifying their costs. Now there's something to note, that navy units are supposed to involve flanking. That and strategy. While making sure both are useful wouldn't be easy, I don't doubt they'd enhance gamplay, and that could be useful for defying expectations, and good thing when there may be more Genki Girls like MKayKitKatz (if you must know, I met her because of her Battalion Wars 2 Multiplayer FAQ) who have navy as their favorite branch instead of something expected to be more kinetic like the air force. Of course, that second picture is still an indication of why AW's navy would end up having problems that shouldn't be. Seriously, the Cruiser uses an MG to hit air units, including Fighters, so what's the aesthetic excuse for it not riddling foot soldiers full of bullet holes? If map designers can use creativity to find the answers to these, that would of course be welcome. However, if worse comes to worse and design problems are too OTT, let me tell you that I've been disassembling Game Boy Wars 3 as of late to learn how to program AI among other things, wanting to make my own Spiritual Successor to Battalion Wars (that's obviously a leap in programming skill, but learning how to program pathfinding for example is something I'd have to figure out anyway), and let me tell you that GBW3 does have its share of ideas that could actually be sound (most notably for this, plenty of sea units, including the Lander, have anti-air, but not as superpowered in both offense and defense as the Cruiser's) and would just need streamlining to work well, something GBW3 doesn't do well but it's not like creativity can't at least be used for helping in any effort at a Spiritual Successor of AWBW or regular AW. Thanks a lot for this deep analysis and the thoughts. It is too simple to say that any "middle" island with properties generates FTA. If the island map is well defined with the landing sites etc, it can be similar like the middle properties on a land map. There is always one player who can reach a certain strategic point first in a map. Still the problem of the island map that the "normal metagame" does not fully apply remains. (e.g. rockets are much more playable on an island map and direct combat land units like tanks become less interesting. I think that the island layout emphasizes FTA more than a normal map with central properties. On a conventional map, centralized properties can be dangerous but are gradually approached and there's usually less incentive to rush (though that can obviously be a viable strategy on many maps). On island warfare maps, of the type that I described, the islands are typically more valuable from a funding and positioning standpoint than centralized properties on conventional maps because they come in clumps. The first player to land there has a major advantage in capturing the island because they're not very reinforceable, so not capturing and/or striking first is hard to come back from, essentially giving that entire clump of properties to the player who can land first. To make matters worse, there usually aren't other areas of conflict at this point of the game where, say, in a conventional game a player might get punished for ignoring during the capture phase. Here, the buildup is typically slower and there are fewer conflict areas, making the drawbacks to rushing minimal in many cases, while the benefits are much greater. Anyway, that's just my quick 2 cents on why maps of this style emphasize FTA more than their land warfare counterparts.